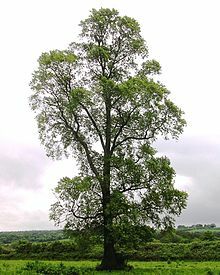 From Old English elm, from Proto-Germanic *elmaz (compare dialectal Low German Elm, dialectal German Ilm, Norwegian and Swedish alm), from Proto-Indo-European *h₁élem 'mountain elm' (compare Irish leamh, Latin ulmus, Albanian ulzë (“maple”)). (countable) A tree of the genus Ulmus of the family Ulmaceae, large deciduous trees with alternate stipulate leaves and small apetalous flowers. (uncountable, usually attributive) Wood from an elm tree. Ultimately from Arabic عِلْم‎ (ʿilm).